The 126-foot Virginia, a re-creation of the last Virginia pilot schooner that sailed the Chesapeake Bay in the early 1900s, calls at Cape Charles Town Harbor this weekend. 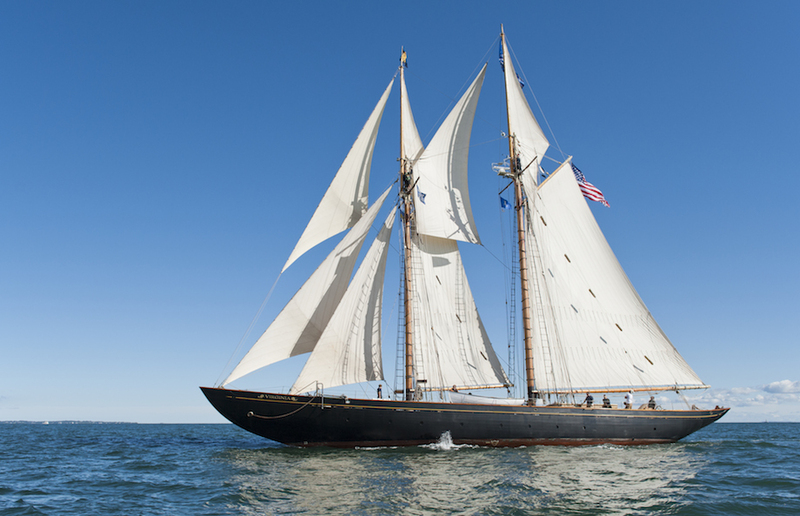 The Virginia sails as an educational vessel, conducting programs along the East Coast. The schooner will host free deck tours on Saturday, Sunday, and Monday, May 31-June 2. Crew members will conduct tours and answer questions about the Virginia’s construction, sailing schedules and life aboard the ship. Free deck tours do not require a reservation. There will also be Sunset Sails Saturday, Sunday, and Monday, 6:30-8:30 p.m. CLICK for reservations. A two-masted, gaff-topsail knockabout schooner, the Virginia is 126 feet long, 24 feet wide and weighs 157 tons Her mainmast towers 112 feet off the water. She is homeported in Norfolk. The ship is a re-creation of her namesake vessel, the last all-sail vessel built for the Virginia Pilot Association. The pilots relied on fast, seaworthy, and easily handled vessels that could operate in all kinds of weather. The pilot schooners of Virginia became world renowned for these traits and stayed in service long after other vessels had turned to steam. In the early 20th century there were still many ships under sail coming through the Capes, and the pilots needed to keep their sailing skills sharp. The original Virginia was built to serve as a floating home and training vessel for the pilots. The Virginia Pilot Association worked the schooner from 1917 to 1926, when she was replaced by a steamship. Today’s re-created vessel links hundreds of years of tradition to modern times. The Virginia is owned and operated by the Virginia Maritime Heritage Foundation, a nonprofit organization established to promote the maritime heritage of the Commonwealth.